We have the UCase() Function in Access to convert all letters in a string of Text into upper-case letters(UPPER() Function in Excel). LCase() Function (LOWER() in Excel) of Access converts all the Text in a string into Lower-Case letters. PROPER() Built-in Function of Excel converts first letter of each word in a string of text into upper-case and rest of the text into Lower-case. Microsoft Access Function StrConv() can do what PROPER() Function does in Excel. The conversion type parameter - an integer value. Here, parameter value 3 stands for Proper-case conversion. I know what you are thinking; can we do other conversions also with this Function? and STRCONV(Text,2) for LCase() Function. There are other usages for the STRCONV() function, with different parameters. If you are interested to explore further then type STRCONV in the search control of Microsoft Access Help Documents and get the details. 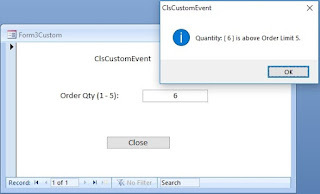 If you think that the name of the function is difficult to memorize, requirement of a second parameter is also too much work then we can go by the Excel way and define a PROPER() Function in Access and use it wherever you want. Copy and Paste the above VBA Code into a Global VBA Module of your Project. If you have a Library Database then copy and paste the Code into it, so that you don't have to duplicate it in all your other Projects. I will not be surprised if you name the function as PCase() in line with the other text conversion functions LCase() and UCase().